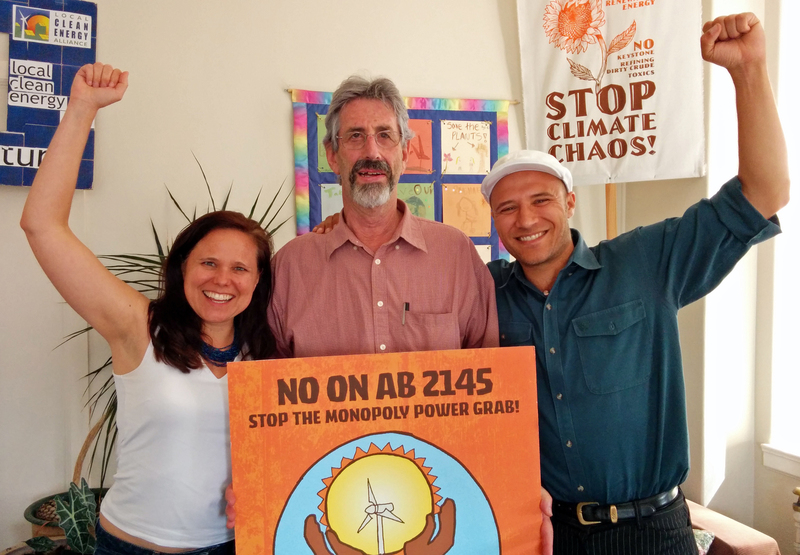 Kirsten Schwind, Local Clean Energy Alliance (LCEA) Steering Committee member, Al Weinrub, LCEA Coordinator, and Colin Miller, Clean Energy & Jobs Oakland Coordinator celebrate the AB 2145 victory. As the final gavel fell on this year’s state Senate legislative session at 3am on August 30, AB 2145, the bill meant to kill Community Choice energy programs in California, met its own well-deserved demise. This result was a stunning victory for community-based energy advocates. PG&E and the other investor-owned utilities in California were behind this bill as part of a long-standing attack on Community Choice as representing an alternative, democratized energy model to their utility monopoly. They fronted the bill through their unions, mainly IBEW 1245—the kind of unions that take positions supporting their employers as the best route to providing benefits to their members. Based on having lined up the California Labor Federation early on, the utility unions promoted AB 2145 as pro-labor, pro-consumer legislation. Democrats in Sacramento, who count on big utility and big union backing for their election campaigns, supported the bill, and it sailed through the Assembly, despite an intense lobbying effort in Sacramento by statewide supporters of Community Choice energy programs. The assessment of several long-time energy policy observers, former legislators, a former California Energy Commissioner, and several veteran lobbyists, was that the forces assembled to advance AB 2145 to enactment would be nearly impossible to beat. 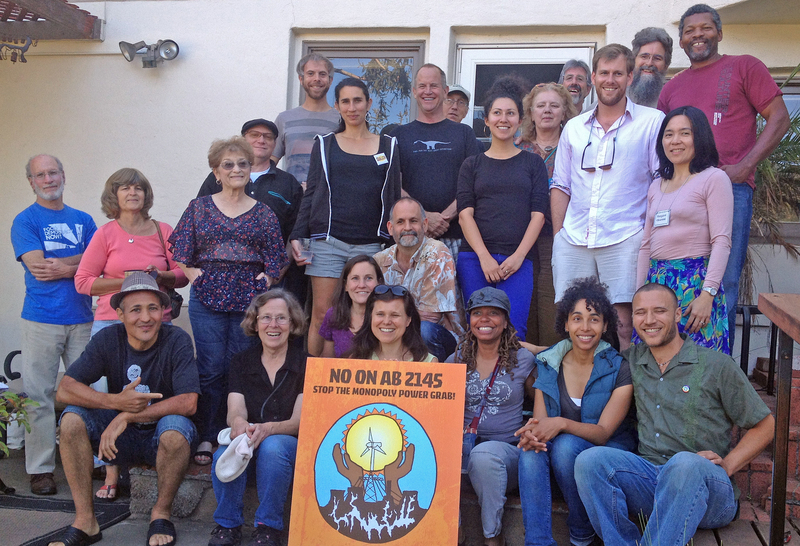 Community Choice advocates around the state, however, who had been participating in a long-standing monthly conference call since 2010 dug in their heels and amped up opposition to AB 2145, as did the two existing Community Choice programs (MCE Clean Energy and Sonoma Clean Power). These advocates for local control of electricity reached out to organizations across the state, stressing the benefits of Community Choice and painting the bill as an attack on these benefits and on competition in the electricity service sector. They exposed the bill as a monopoly utility power grab meant to kill Community Choice energy programs. The opposition campaign set up a No on AB 2145 web site under the name of Californians for Energy Choice (CfEC). In the short space of a month or two, the outreach effort signed up about 200 organizations—representing local government, environmental, social equity, business, and labor groups—to oppose AB 2145. The two existing Community Choice programs, however, declined to join the CfEC Coordinating Committee, maintaining their independence from the grassroots opposition campaign. The campaign Coordinating Committee consisted of the following organizations: Climate Protection Campaign, California Environmental Justice Alliance, Local Clean Energy Alliance, Asian Pacific Environmental Network, San Francisco Clean Energy Advocates, Communities for a Better Environment. The Committee reflected the broad appeal of Community Choice programs, especially for low income communities of color—those most impacted by the growing economic and climate crisis. As the bill headed into the Senate, CfEC mobilized to kill AB 2145 at the Senate Energy Committee hearings in late June. This opposition involved letters from the roughly 200 CfEC organizations, about 30,000 opposition emails from individuals across the state, direct lobbying of Energy Committee members in their districts and in Sacramento, a rally in downtown Oakland on June 19, a news conference on the steps of the Capitol on June 23, the day of the hearing, and large numbers of organizations testifying in opposition to AB 2145 at the Senate Energy Committee hearing. However, this strong grassroots effort to kill the bill was undermined by a difference in strategy between the grassroots campaign of CfEC and other forces: MCE Clean Energy, Sonoma Clean Power, LEAN Energy US, and Sierra Club lobbyists brokered a last-minute deal that removed the bill's worst "opt-in" provision in exchange for additional geographic restrictions on Community Choice. Hence despite CfEC’s efforts to bury the bill, it passed out of the Energy Committee, weakened but still very much a threat to Community Choice programs. Efforts by CfEC to kill the bill outright next focused on the Senate Appropriations Committee, with a similar mobilizing effort, but with little official support from the above-mentioned organizations, which effectively removed their opposition to the bill based on the deal they had agreed to. MCE and LEAN eventually reaffirmed opposition to AB 2145 when it appeared that the deal they had cut at the Energy Committee hearing was not being honored by the bill’s author, Assembly Member Steven Bradford, a former public relations executive with Southern California Edison. CfEC's focus at the Appropriations Committee was on the cost to the state and local communities of provisions in AB 2145 designed to kill Community Choice programs. Despite nearly two-dozen organizations testifying against the bill on August 14—and none speaking in favor—AB 2145 passed out of the Appropriations Committee, further weakened by removal of another toxic provision: the five-year rate setting requirement for Community Choice programs. As AB 2145 headed to the Senate floor, CfEC raised money and hired its own lobbyist to help defeat the bill. Though coming on board very late in the game, the lobbyist provided CfEC with Sacramento insider perspectives, contacts, and tactical advice that helped focus the grassroots opposition effort, all targeted at denying the bill the 21 votes needed for passage. This targeted lobbying, in addition to the very public efforts of CfEC over the previous months, threatened to deny the bill the majority it needed for passage, even though it had cleared two Senate committees. A key difficulty for AB 2145 was that as the Senate session was nearing its conclusion, Bradford apparently could not find a member of the Senate willing to champion his bill. As a result, it never came up for a vote on the Senate floor. There were many diverse players involved in the fight against AB 2145, and all will undoubtedly have perspectives on the decisive efforts behind the CfEC victory and the monopoly utilities' failed attempt to legislatively kill Community Choice. As indicated above, the unfolding dynamics were quite complex. Any analysis of these dynamics would have to take into account the interplay of a number of issues: contention over whether to kill a rotten bill or seek to amend it, the appropriate relationship between grassroots efforts and professional lobbyists, the interplay between grassroots organizations and established institutions, the importance of building a movement rather than relying on Sacramento insider logic, the role of labor—and particular unions—in providing cover for corporate interests, and so forth. But what is undeniably clear is that the most important element to this victory was the level of commitment, dedication, action, sacrifice, cooperation, and shared objective of both individual Community Choice advocates and their organizations to marshal the resources at their disposal to press forward until victory. It was a tenacious and herculean grassroots effort, and in that respect, was a model to emulate elsewhere. This is how the future will be built. Community Choice advocates celebrate successes of Californians for Energy Choice at a backyard BBQ at home of Al Weinrub, even before the final victory.